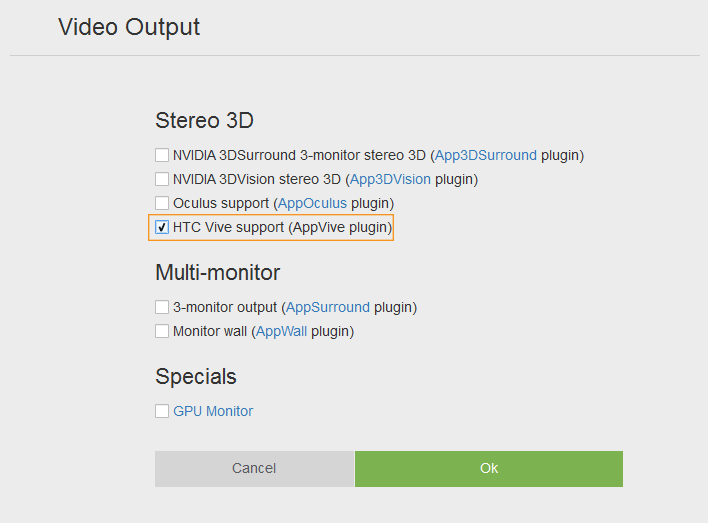 An AppVive plugin is used to support the HTC Vive head-mounted display. It is supposed that you already have an HTC Vive installed. SteamVR will be set automatically on the HTC Vive installation. To run the plugin sample from the UNIGINE SDK Browser, go to the Samples tab, choose UnigineScript -> App and run the app_vive_00 sample. Download Vive Setup and perform all the required steps. 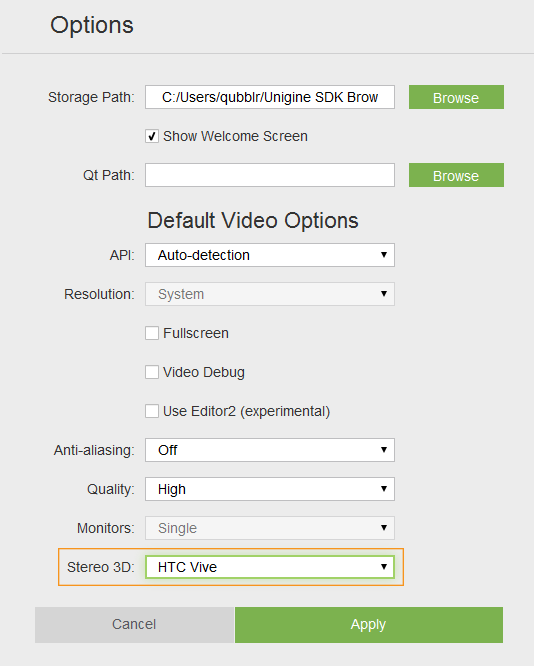 Create a new project with AppVive support via UNIGINE SDK Browser: click Video Output Options, check the Vive support (AppVive plugin) option in the form that opens and clickOk. To add Vive support to an existing project, in UNIGINE SDK Browser, click Other Actions ->Configure Project -> Video Output Options -> Vive support (AppVive plugin) -> Ok. Implement the application logic by using functions of the AppVive plugin API. You can also change the plugin API functions or add new ones and then recompile the plugin. Plug in the HTC Vive virtual display. Launch the AppVive plugin on the application start-up. 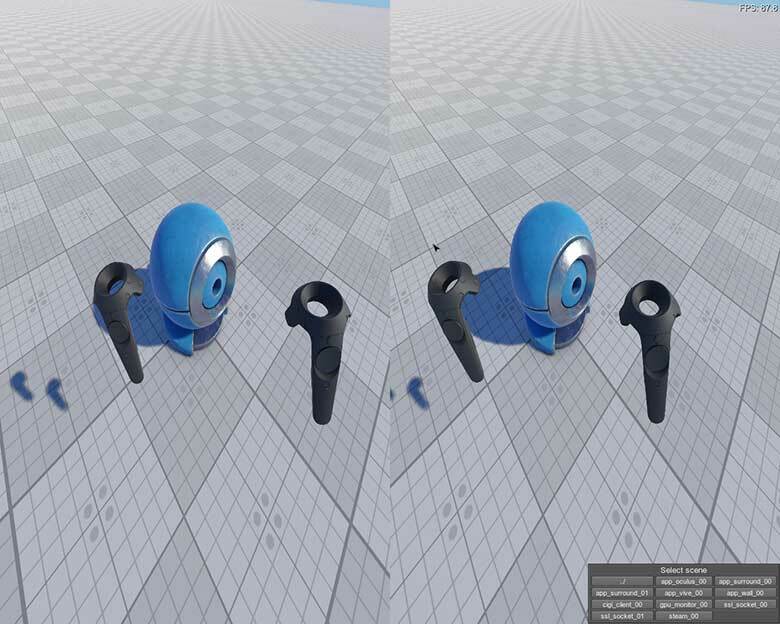 vive_render_width and vive_render_height - set a resulution for each eye. The default resolution for one eye is 1512x1680. The same resolution is set for both eyes. Get the HTC Vive SDK. Via Microsoft Visual Studio: go to the <UnigineSDK>\source\plugins\App\AppVive, open the appvive_vs2013.vcxproj or appvive_vs2015.vcxproj project and build it.